Produced by HHP and Honeywell. Our refurbished HHP Dolphin 9500 mobile computers deliver unparalleled performance and value for all mobile data collection applications. Their lightweight, ergonomic, and rugged designs provide the ease of use and operational reliability needed to excel in robust mobile applications such as package delivery, field service, route accounting, transportation, warehousing, retail, and industrial/manufacturing. Contact us today about buying, servicing, renting or selling HHP Dolphin 9500 gear! 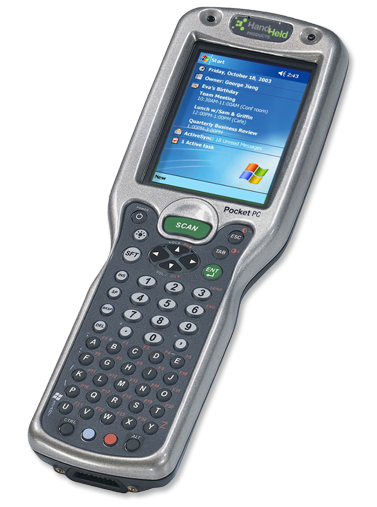 For maximum speed, efficiency, and usability, the Dolphin 9500 series comes equipped with the Intel XScale processor and the Pocket PC platform. The high-performance system architecture is powered by a large capacity, hot-swappable lithium-ion battery pack, enabling the Dolphin 9500 to operate longer in wireless, scan-intensive environments. Designed to provide seamless data and voice connectivity for you and your mobile workers, the refurbished HHP Dolphin 9500 features an integrated triple-radio design for wireless WAN, LAN, and PAN communications. This state-of-the-art feature provides real-time information access anytime, anywhere, while communicating to any compatible wireless device, improving operational efficiency while ensuring data accuracy and security. Integrated HHP Adaptus Imaging Technology provides workers with the data capture tools they need to get the job done quickly and efficiently, whether it is scanning a package for delivery, performing an inventory cycle count, capturing a signature for proof of receipt, or taking a picture of damaged goods. The HHP Dolphin 9500 series performs all these tasks and more, extending the capabilities of your mobile applications and workforce. Contact us today about buying, servicing, renting or selling HHP Dolphin 9500 gear!